Life cycle assessment (LCA) is used to evaluate the environmental impacts of textile products, from raw material extraction, through fibre processing, textile manufacture, distribution and use, to disposal or recycling. LCA is an important tool for the research and development process, product and process design, and labelling of textiles and clothing. 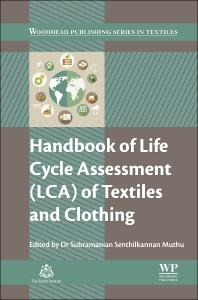 Handbook of Life Cycle Assessment (LCA) of Textiles and Clothing systematically covers the LCA process with comprehensive examples and case studies. Part one of the book covers key indicators and processes in LCA, from carbon and ecological footprints to disposal, re-use and recycling. Part two then discusses a broad range of LCA applications in the textiles and clothing industry. R&D managers in the textile and clothing industries; postgraduate students and academic researchers in textile science; sustainability consultants.